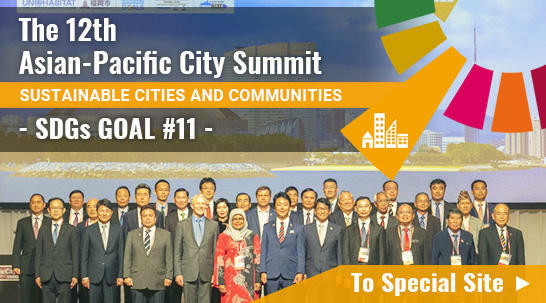 The 5th Asian-Pacific City Summit was held in Fukuoka City during the period August 30 to September 1, 2002, co-organized by the United Nations Human Settlements Programme (UN-Habitat). With the admission of Vladivostok, the Russian Federation, leaders of 24 cities from 12 countries joined here in Fukuoka. At present, almost half of the world's population lives in urban areas. The ratio is predicted to reach 60% in the next two decades. The 21st century is undoubtedly the "Era of Cities." A city government is positioned closest to people living in communities. It responds to citizens' needs by working directly with them to bring about solutions to various urban issues in such fields as environment, transportation and water resources. While its role and responsibility have become remarkably significant, the city administration needs to have clear focus on the increasingly enhanced awareness of the public, as well as their demand for more effective and efficient financial resource allocation. Under the general theme, "New Approach to City Planning for the 21st Century ~ from Governing to Good Governance ~," we, at the Summit, discussed better governance as our common agenda, shared our approaches for ensuring good city management in collaboration with citizens. The possibility of inter-city cooperation was also a major issue of our deliberations. In consequence, we have the common recognition that, in the city management, it has become increasingly important to accurately grasp citizens' needs, promote the customer-based and result-oriented administration and establish a new public management system in which a government can share information with citizens so as to better ensure citizens involvement in the decision making process. Furthermore, at the 4th Asian-Pacific City Summit held in Busan, Korea in 2000, it was proposed to establish a new organization to develop the tourist industry in the Asian Pacific region. We had further discussions on this subject and reached an agreement to its foundation. 1. In order to further promote good governance, we are determined to reflect a number of advanced approaches shared at this Summit meeting on our own city management and to continue to have similar opportunities to learn experience and expertise from each other, with the cooperation of the United Nations, UN-Habitat, and other relevant organizations. We also encourage the utilization of Information Technology in sharing our approaches. 2. We have established the Tourism Promotion Organization for Asian-Pacific Cities (TPO), aiming at the regional development of tourism and economy as a whole in the Asian Pacific cities. We will work together to enrich and promote the function of TPO. 3. We will hold the 5th Working Level Conference in Kumamoto City, Japan in 2003 and the 6th Mayors Conference in Bangkok, Thailand in 2004.